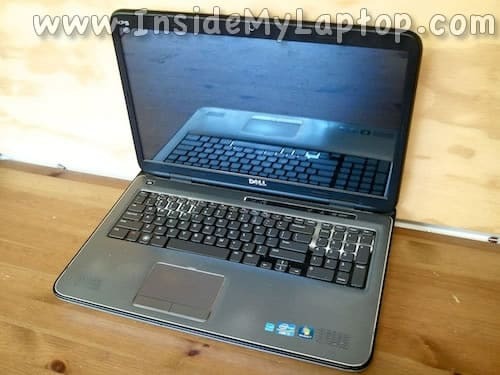 In this guide I show how to take apart a Dell XPS 17 L702X. 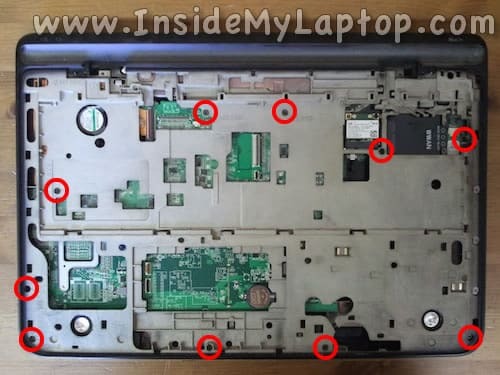 I will remove the bottom cover in order to access the main internal components. 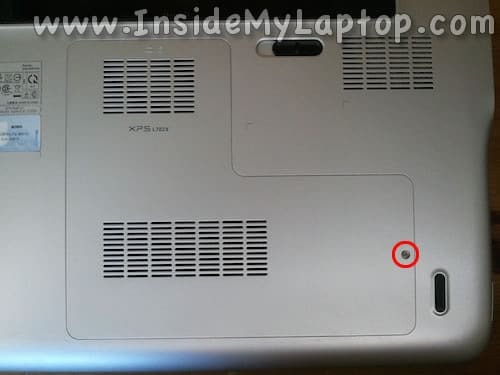 Remove the service cover located on the bottom. 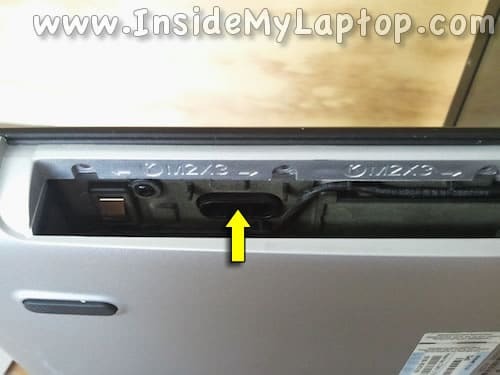 It’s secured by one screw. 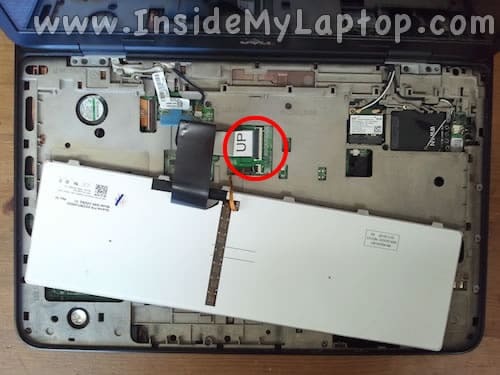 Under the service cover you can access the hard drive and both RAM modules. 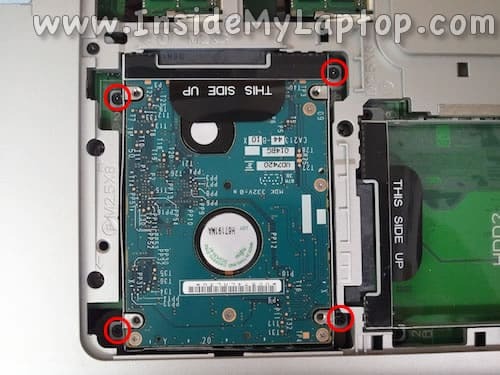 Remove four screws securing the primary hard drive caddy. 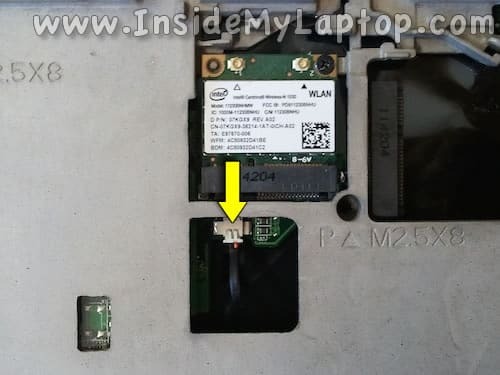 Lift up the back side of the drive and disconnect it from the motherboard. 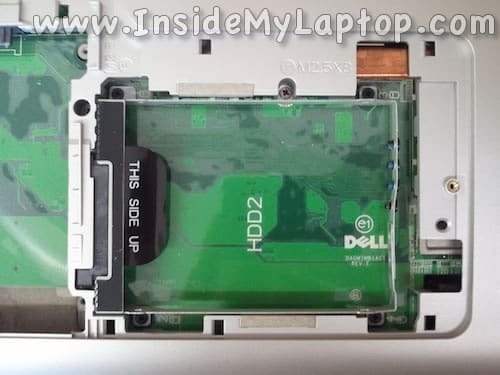 In my model I didn’t have the second hard drive installed. If you do, remove it the same way as the first one. 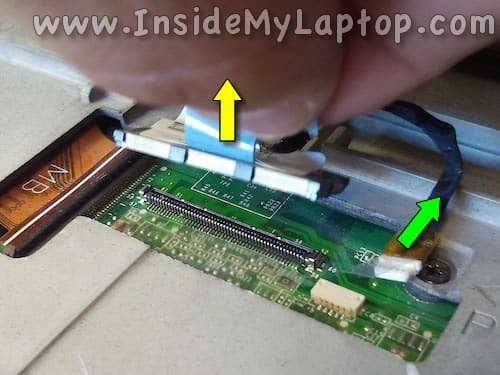 Pull the optical drive to the left and remove it from the case. Remove three screws securing the palm rest assembly. 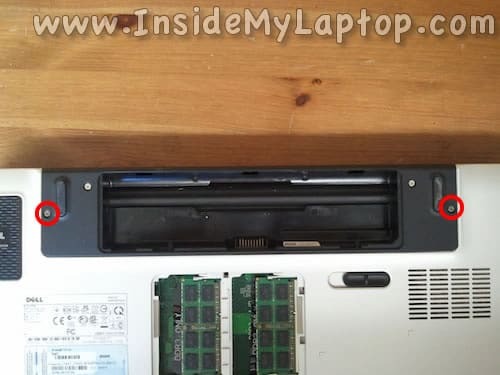 In the optical drive bay you will find an opening where you can push on the back side of the palm rest. When you push on the back side, the palm rest will separate from the bottom cover a little bit. Continue separating the palm rest from the bottom with your fingers. Also, you can use a guitar pick (or any other piece of plastic) as a case opener. Lift up the palm rest assembly. Turn the palm rest upside down. 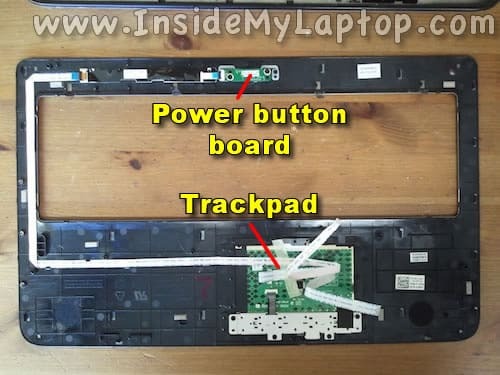 Now you can access the trackpad and power button cable connectors and unlock them. Lift up the retainer with your fingernail. It will pop up at a 90 degree angle. 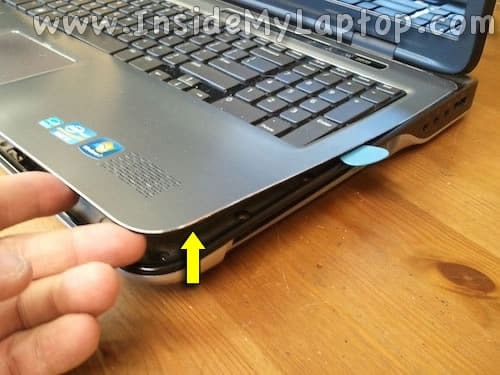 Remove the palm rest assembly from the laptop. 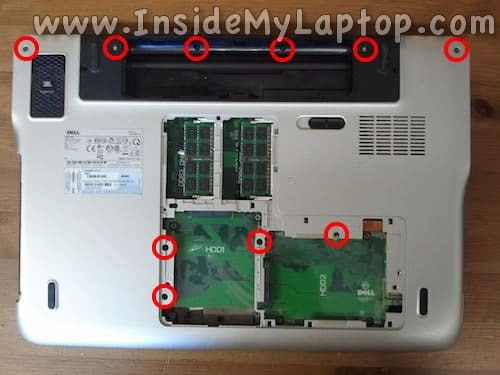 On the back side you can access the trackpad and power button board. 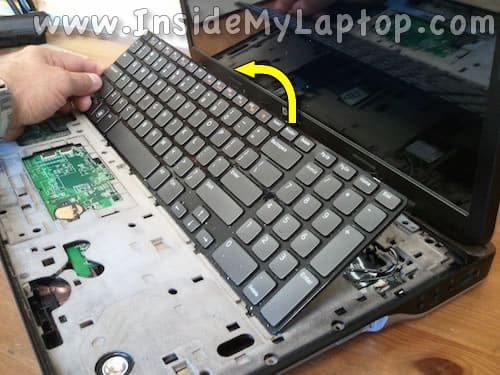 Lift up the keyboard and place it upside down on the top cover. 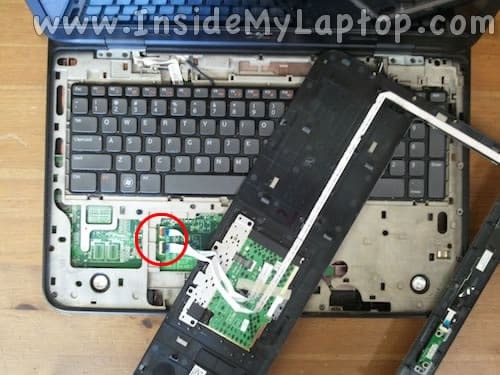 Before you can remove the keyboard it’s necessary to disconnect the data and backlight cables. 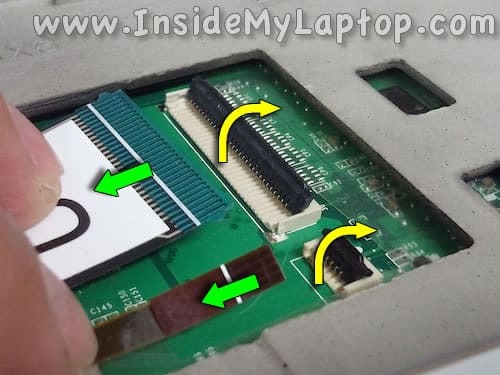 Unlock both connectors the same way as explained in the step 13. 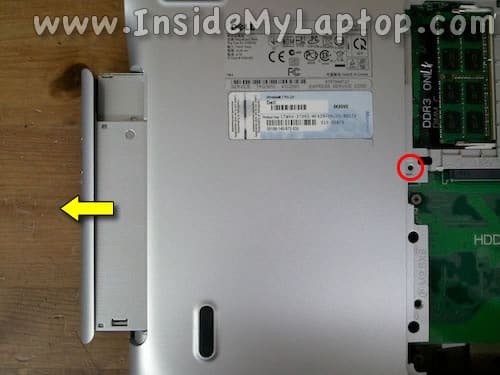 Remove two screws securing display hinges on the bottom . 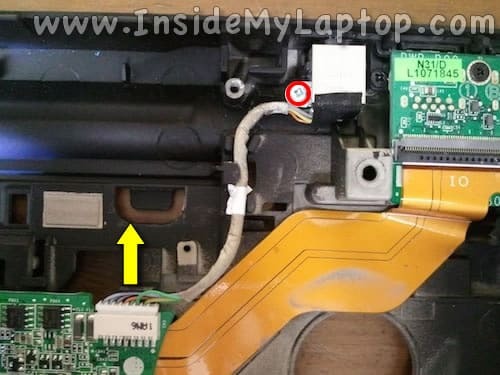 Now it’s necessary to disconnect the display cables and wireless card antennas. Un-route all antenna cables from the to guided path on the top cover. 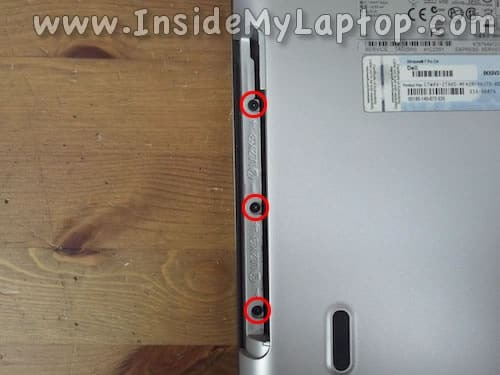 Remove four screws securing the display hinges and one ground screw. 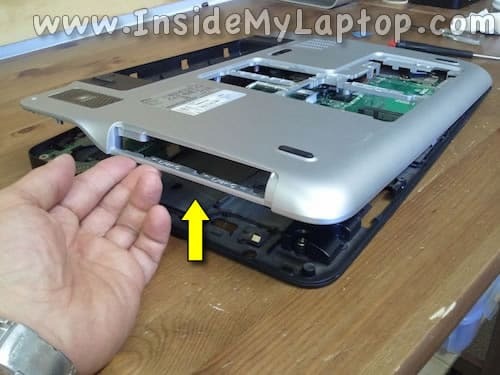 Lift up the display assembly and separate it from the laptop base. 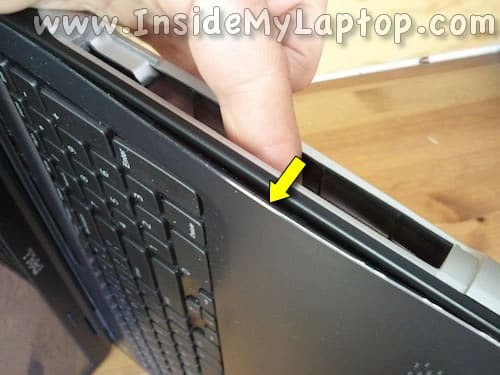 Now you should be able to lift up and separate the bottom cover from the rest of the laptop. NOTE: the motherboard secured to the top cover. 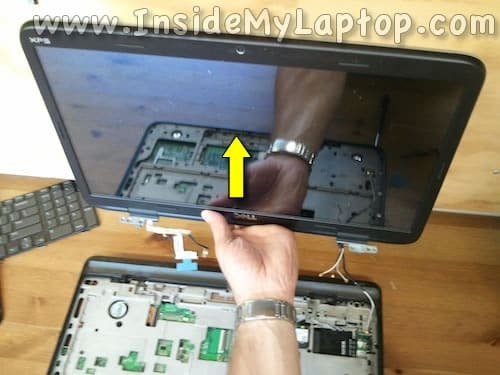 It is NOT necessary to remove the display assembly as shown in steps 18-23 in order to remove the bottom cover. 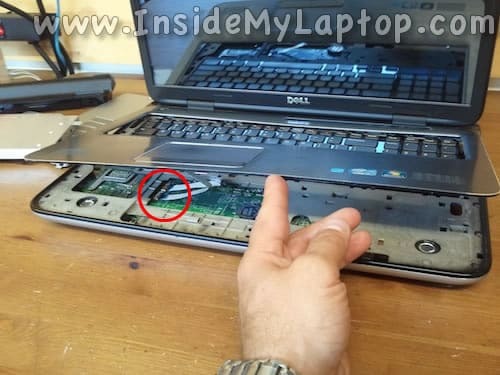 You can do it while the display is still attached to the laptop. It’s ready for cleanup or replacement. 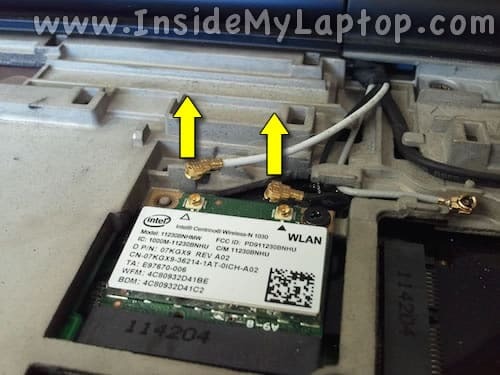 Remove one screw securing the power connector (DC jack). 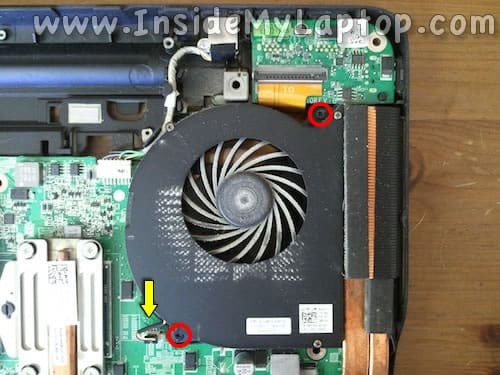 Unplug the power connector cable from the motherboard. 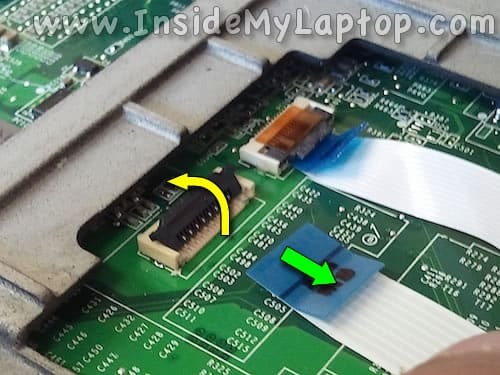 Now you can remove the power connector and replace it with a new one if necessary. 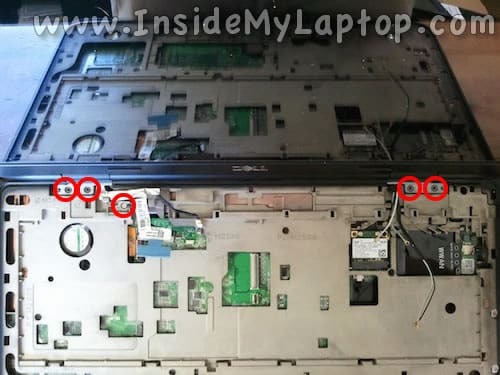 For more detailed disassembly instructions you can follow instructions in the official service manual for Dell XPS 17 X702L. A question about the display cables you detach at step 20: the left one is normal video, but what is the small right one?? 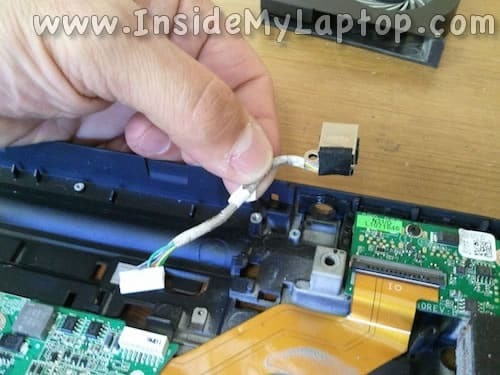 This is the webcam cable. 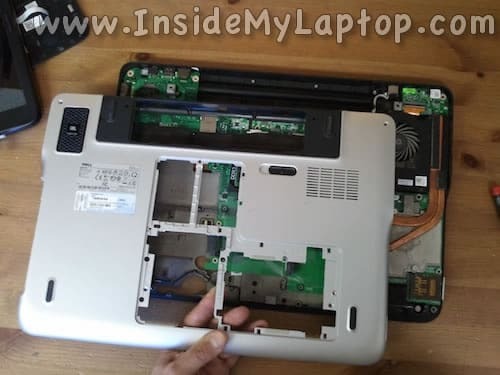 very good contribution, my question is … why not start my computer after the disassemble and went back to join. 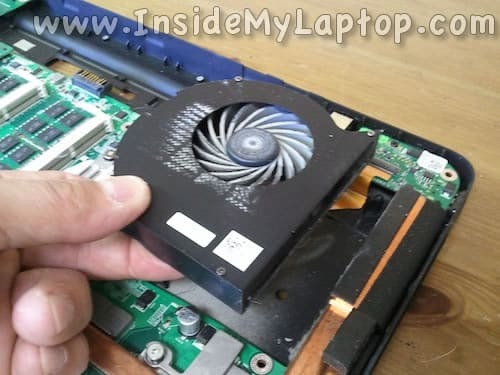 I press the power button, turn on all the lights but not turn the screen and the fan cooler, makes a noise from the speakers and then turns off. what is? help!